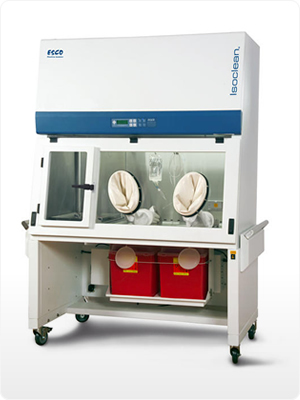 Barrier isolation system provide inherently superior sterility compared to open front clean air devices such as laminar flow clean benches and Class II biological safety cabinets. USP797 guidelines specify that isolators may be situated in an area subject to less severe environmental controls compared with open front clean air devices. When used as part of a system that includes operator aseptic technique training, process validation, expiration setting, product quality maintenance after the CSP leaves the pharmacy, isolators are a cost-effective solution especially for lower-volume pharmacies. They reduce operating and renovation costs, take up less space, and are easier to maintain. The positive pressure isolator is suitable for work involving non-hazardous materials. The work zone and pass-thru interchange are under positive pressure to the room in order to maintain sterility in case of a breach in the barrier isolation system. Negative pressure models should be selected for antineoplastic or cytotoxic compounding applications. Streamline® Compounding Aseptic Isolator, provides a safe and clean environment for compounding of non-hazardous, sterile drug preparations and IV admixtures in compliance with USP 797* criteria. (WxDxH) Without Base Stand - 52.8" x 32.3" x 51.9"
With Base Stand (Min) - 59.9" x 32.3" x 78.5"
With Base Stand (Max) - 59.9" x 32.3" x 88.6" Without Base Stand - 76.8" x 32.3" x 51.9"
With Base Stand (Min) - 83.9" x 32.3" x 78.5"
With Base Stand (Max) - 83.9" x 32.3" x 88.6"
Main Chamber Work Zone (WxDxH) 33.1" x 24.0" x 26.4" 57.1" x 24.0" x 26.4"
Pass Through (WxDxH) 13.9" x 24.0" x 26.4" 13.9" x 24.0" x 26.4"